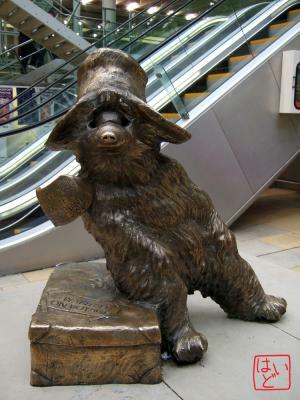 At the time I found this statue at Paddington station, I was waiting for a train for Cotswolds. This is the statue of Paddington bear. Paddington Bear is one of the most famous children's storybook characters in the UK. The story of Paddington Bear was first published in 1958 in the UK, and the bear became very popular. The story has also been published around the world. This life-size stature created from an illustration in the storybook was unveiled in 2000. When I finished pre-school, my teacher gave me the storybook. I became a fan of the bear. I can see soft toys of the bear every souvenir shop in London. However, I had not come to Paddington station and thus had not known the statue. I was glad to see him at the station.